Seoul: North Korea threatened on Friday to pull out of the Asian Games due to take place in rival South Korea later this year, accusing the South of plotting to block its athletes from taking part. A rare meeting between the two sides on Thursday ended with no agreement on the size of the North's contingent, which is expected to include about as many cheerleaders as athletes. 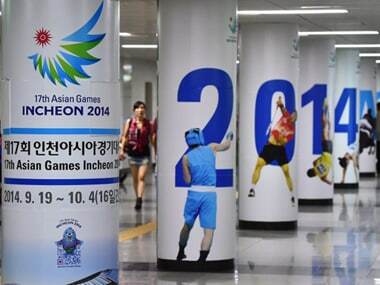 Local media said the North had proposed sending 350 athletes and the same number of cheerleaders to the games, scheduled for 19 September to 4 October in the port of Incheon. The numbers were larger than those earlier provided by Pyongyang. The North's official KCNA news agency said negotiators from the South, acting at the behest of President Park Geun-hye's office, had made "absurd assertions" at the talks in the truce village of Pammunjon on the heavily militarised border. KCNA said progress registered earlier in the day had been overturned by calls by the South's envoys to "follow international practice" and suggestions that "the scope of the delegation is too big". "The DPRK side branded such attitude of the South side as a deliberate act to bring the working talks to a rupture and prevent the DPRK from taking part in the games," it said. DPRK is short for the Democratic People's Republic of Korea. "It clarified that if the South side insists on such a defiant attitude, it will fundamentally re-examine its participation in the games." The meeting was also meant to discuss transportation and accommodation for the North's contingent. The cheerleaders have proved a huge attraction in rare appearances in the South since the end of the 1950-1953 war, with tightly choreographed gymnastic routines and messages of peace and unification. In 2005, Pyongyang sent 101 cheerleaders, including Ri Sol Ju, who has since married North Korean leader Kim Jong Un, to the Asian Athletics Championships in Incheon. Athletes from the North and South have paraded together at several sporting events under a "unification flag" used specifically for that purpose. Joint marches took place at three editions of the Summer and Winter Olympic Games. North Korea is subject to UN sanctions for its missile and nuclear programmes and has threatened to conduct a fourth nuclear test. Its leaders demand the South halt routine joint military drills with the United States. South Korea has urged the North to take steps to end its nuclear programme. North Korea routinely threatens to destroy its neighbour, though it has recently proposed steps to ease tension. It has, however, test fired several short-range missiles and rockets over the past three weeks and threatened to pursue the tests.